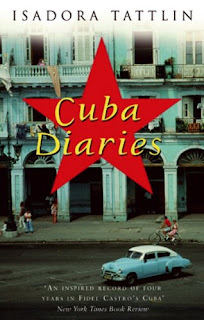 Isadora Tattlin is a pseudonym and most of the names in her Cuba Diaries have been changed. However, this takes nothing away from the extraordinary insights into life in Cuba during the late 90's and the periodo especial en tiempo de paz (special period in time of peace) immediately after the withdrawal of economic subsidies from the Soviet Union. Her love/hate relationship with Cuba over four years has been documented with shopping lists, brief political discussions, history lessons and loads of observations and day to day stories. Yes, Tattlin was living a privileged life in Cuba, but then again, most visitors to Cuba would fit that category, especially during the 90's. Her husband worked as an executive for an unnamed European energy company and they mixed in exalted company, eventually having Fidel Castro himself to dinner a couple of times in their final year in Cuba. Tattlin's obsession with shopping (of the art and jewellery and furniture variety) wore a bit thin by the end, but her daily observations - the everyday fears, worries and delights of living in a foreign country were captured succinctly and sincerely. As a future visitor to Cuba, I lapped up every word. I had studied the Cuban Revolution - viva Fidel y la revolucion socialista (long live Fidel and the socialist revolution) at school - so I was aware of the basic facts of history, but the 1990's was an unknown era for me. Tattlin vividly described her experiences in trying to conseguir (obtain) food and other necessities. There were also lots of trips to other areas of the country - places we plan to visit too - like Santiago, Trinidad, Vinales, Camaguey, Holguin and Cienfuegos. Petty crime and the constant hassling or hustling for money by the Cubans was another factor to manage. I can't imagine what it must be like to live a life of near-poverty with very few opportunities to change that situation...and then have busloads of near-wealthy tourists passing through, glittering and flashing their wares and education and worldliness. Tattlin and her family were more embedded than that into the Cuban way of life, but they still stuck out as being different and lavish in their lifestyle. Obviously, this all happened over twenty years ago, and times have changed. Castro's alliance with Venezuela throughout the 2000's brought some economic security and prosperity. Relations with the US also gradually thawed during this time. Due to poor health, Fidel eventually handed the presidency over to his brother, Raul in 2008. Raul immediately removed restrictions on mobile phone use for Cubans and announced a plan for economic reform in 2011. He installed vice-president, Miguel Diaz-Canel in 2013 and stated that his presidency would end in its second term in 2018. Fidel's death, last month was honoured with a nine day period of national mourning. At his request, there will be no statues, parks, institutions or streets named after him to prevent a cult of personality from developing. Tattlin's epilogue, written a couple of years later, unexpectedly veered off into the realm of magic realism. Perhaps, with a few years reflection, her time in Cuba started to feel surreal and imbued with fabulism. It was a curious way to finish off her practical, fairly dispassionate diary...but perhaps that's the effect that Cuba can have on you. Now that I've had this tantalising, intimate journey into 1990's Cuba, I'm even keener to observe modern day Cuba. Following your travels to every country and sea in the world! #WorldFromMyArmchair Ola, Cuba! Great review...and anxious to hear what you experience in Cuba! Where does your next'book journey' go to? I will then (probably) delve into my pile of Australian non-fiction - and finish some of those unfinished books!! I have 6 Australian non-fiction by women all lined up for #AWW 2107! I am surprisingly incurious about Cuba, which is so odd. I usually want to know everything about everywhere. Perhaps it is because I know so little about this country. Perhaps I should check out this book.